Lately I’ve been trying to find an all natural shampoo/body wash for my 3-year-old son. We had previously been using just a basic Suave body wash that is inexpensive and it did seem to work, however, I don’t like that it has a lot of chemicals in it that probably aren’t the best for my him. So, I went on a hunt to find a wash that smells good, lathers up nicely, and most importantly is free of parabens and other harmful additives. The first one I tried was Fresh Monster Kids Shampoo & Body Wash with a scent called ocean splash. It costs about $7.99 for 8 ounces on Amazon (link to company below) and it touted a toxin-free ingredient list and is entirely plant-based. I did like the scent of the soap, but it just did not suds up very well so I felt that it was lackluster. It always seems that soaps without lather are just too watery and aren’t doing their job. Next I tried My True Nature Daisy’s 2-in-1 Shampoo with Body Wash in the citrus fresh scent. It costs about $10.50 for 8 ounces on Amazon. (link to company below). They claim to be a wonderful product for children with sensitive skin and eczema and are completely natural and non-GMO. Like some of the other Amazon reviewers noted, however, the scent is just too citrusy/orange smelling which was overwhelming. It did suds up better than the Fresh Monster, though. 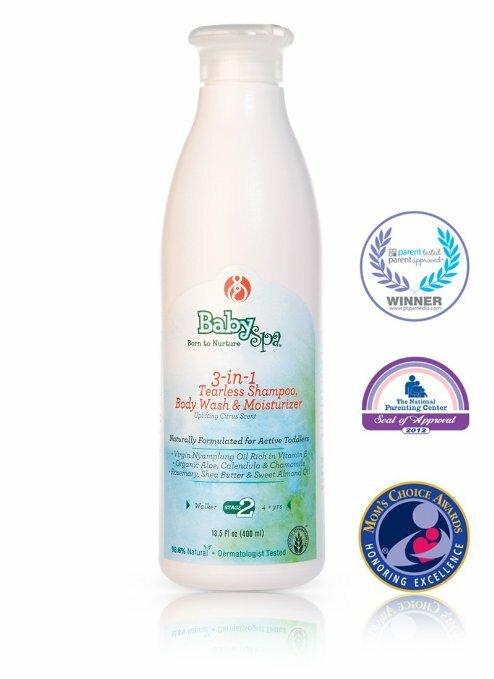 Finally, we just ordered BabySpa 3 in 1 Tearless Shampoo, Body Wash & Moisturizer. This runs about $16 for 13.5 ounces on Amazon (link to company below). The description states that the product is 99.1% natural and has olive oil, avocado oil and shea butter in the list of ingredients. It has a lovely baby powder scent that is light and refreshing. The write-up also categorizes this as a newborn and crawler stage product, but I think it’s appropriate for a toddler as well. I’m actually not sure if the toddler formula smells the same, as Amazon twice sent me the baby formula (although I ordered the toddler one). It lathers up really well and it rinses easily and without issue. We are liking this product quite a lot, and it makes his hair super soft, which is a definite plus!